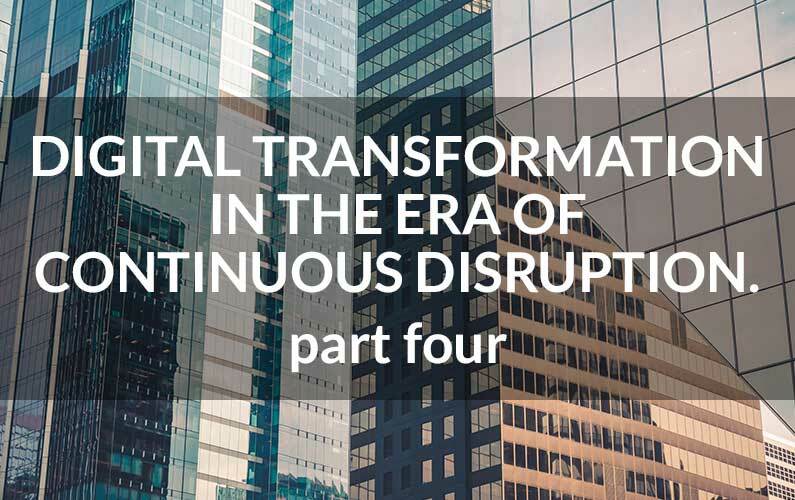 In our series on digital transformation, we’ve recently explored how to thrive in the era of digital disruption, how to rethink digital transformation strategy and the importance of orchestration. In this, the fourth blog in our series, we continue our focus on the execution side of digital transformation with a look at the importance of intrinsic innovation. Since digital transformation is clearly a journey, not a destination, today and in the years ahead organizations need to be able to continuously innovate to create compelling new business models, processes, products and services to delight their customers. Due to the pace of technological change and the digital disruption occurring in today’s markets, this continuous innovation needs to occur at pace that will stress test even the most advanced organizations and which will separate those who ultimately thrive in this environment from the rest of the pack. It’s our belief that the way organizations innovate and the way that they conduct their digital services design, development and deployment – we call this digital services mastery – will need to change substantially so that it’s not just a competency anymore, but something that’s intrinsically ingrained into their corporate DNA, their culture and their way of work. It’s no secret that some of today’s most powerful business models are based upon platform business models. These models, such as that of GE Predix in the B2B space, provide an industry cloud together with apps and services for others to extend with new digital services that continuously enhance the value of the platform and the network. This year alone, the analyst firm IDC expects 80% of companies with advanced digital transformation strategies to be adopting and implementing these industry clouds and platform business models. To build intrinsic innovation into your business model, we believe that these types of platforms can help you gain valuable network effects and a virtuous cycle through the power of the platform and your ecosystem of partners. This means your ecosystem is helping you grow and you don’t have to go it alone. If you’re curious about the steps involved from strategy to execution, our recent case study of GE Predix entitled “Platform business models: 4 key steps for implementation” can help you explore how to establish the business and technical foundation, align internal stakeholders, build success with external customers, and then scale your ecosystem with more apps and services. In prior years, vast organizational processes—both front-office and back-office—were designed over many months or even years and were then implemented, refined and optimized over time with ongoing minor adjustments and tactical improvements. Today, it’s no longer sufficient to web-enable or mobile-enable an old existing process, it’s vital to completely rethink the process and imagine the art of the possible in the new digital environment—drawing from the rich palette of today’s emerging and disruptive technologies. To take a classic example, the most innovative banks didn’t just use mobile devices to help you find an ATM to deposit a physical check, they completely re-envisioned and redesigned the process so you could make the deposit from home by taking a picture of your check using the features inherent in the device. To optimize processes, we therefore believe it’s important to take this “art of the possible” approach to completely rethink your process, but also to leverage emerging technologies such as AI in areas where they can help make the refinements for you. This means putting technology to work to optimize your process, but also to use technologies such as AI to deliver highly tailored services to every customer. In manufacturing, Industry 4.0 envisions a world where products can be manufactured down to a lot size of “1” and we believe that AI can assist in delivering optimized processes and personalized experiences down to a customer size of “1” as well. As you move into an environment of rapid change, where you’re working with the inherent agility of platform business models and creating digital assembly lines to quickly introduce new apps and services, it’s important that this new style of work becomes part of your culture and not just a series of one-off projects. It’s also important to put into effect strong governance and change management to ensure you retain the needed levels of security, privacy, compliance and quality in your digital services which can often fall victim when less well-governed agile approaches are involved. A culture that encourages innovation, ownership, high standards and delivering results can go a long way to help support your digital transformation objectives and enable this intrinsic innovation approach within your corporate DNA. To justify ongoing investments, it’s important to measure results and continuously communicate success stories with stakeholders and sponsors. Since traditional business cases are moving from once-a-year monolithic tomes to far more agile, iterative approaches (see our earlier piece on how to rethink digital transformation strategy), the feedback loop from past implementations back into new initiatives needs to be correspondingly agile and to operate at the same cadence. Post-project valuations and assessments can help to support this continuous feedback loop and give you valuable metrics to aid in strengthening your new initiatives and proposals. Managed services can also help free you from “keeping the lights on” and help to free up more of your resources for innovation. At the same time, these managed services can be focused on helping to maximize value realization so that you can get the most out of your digital transformation investments. At ClearPrism, one of our major service lines for digital transformation is called ClearAssure. Through this service line we offer services that include post-project valuation, continuous innovation, solution enhancement, process optimization and managed services. While these may sound like traditional services, we’ve incorporated our latest thinking, techniques and approaches so that we can not only help you deliver and measure tangible results, but can move your organization into a position where continuous innovation is an intrinsic core competency. With ClearAssure, we take the responsibility to oversee the day-to-day management of ongoing services so your team can focus on more strategic tasks and the “next big thing” for your business.